And I tried to use the smooth tool to even things out, but I don't think it's working with this. I wonder if it would be easier with CS5 and the width tool? Hi everyone! My name is Samantha Phillips, and I have a BFA in Graphic Design. I love typography and I do a lot of lettering, but I want to take my projects to the next level. Any advice/comments/critiques would be greatly appreciated. This is my first time working with flourishes. 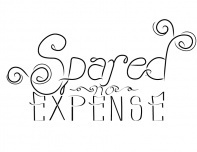 I think the word "spared" looks too thick right now, and like it better in the sketch.